Imagine you own a well established, sophisticated Mexican restaurant in a wealthy neighborhood that is frequented by out-of-towners as much as by locals and has been receiving rave reviews for years. You made a good living and decide to buy the Irish pub a few doors down the street, on the same block. Your logical next move is to announce to your customers that you now run another great establishment, serving different cuisine and drinks, same quality, same owner, just a few doors down. Have a pint after your dinner! And this is where a perfectly logical move is costing you customers instead of gaining them, because you thought of your customers instead of like them. This is not a fictional story. I was reminded of that anecdote when I talked with a client last week about how he must hone in on his target audience and focus on a singular message that speaks to his specific offerings and their specific needs. Sounds so simple, but as you can see, it is not. 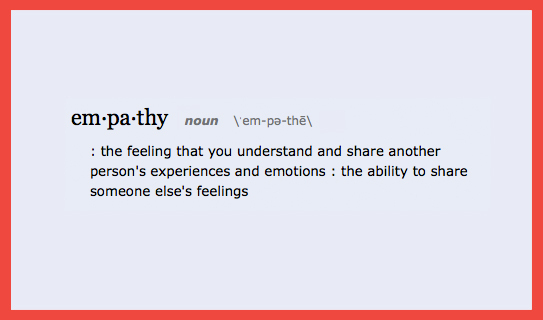 The temptation to reach out to your customers, or to widen your offering or your clientele, often leaves the most important part of branding left behind: Empathy. Don’t think of your customer, think like them. If you would, you would never dilute your established authentic Mexican restaurant brand (which is about an authentic and cultural food experience) with Irish pub chatter (which is about pints in quantity rather than quality). While dining at said restaurant, I saw a tabletop advertising their ‘other’ completely unrelated venture and it turned me off in an instant. So much so that I started coming in only once every month instead of once a week. If the owner would have thought about why people loved her restaurant, she would have ensured to separate the two businesses (A Brand Architecture exercise would have made that crystal clear), their respective audience and outreach. This particular venture experienced organic growth, and that often leads to brand disasters. Thinking like your customer is the single most important thing you can do as an entrepreneur while establishing your brand, and the one that entrepreneurs tend to be doing the least. Next time you communicate on behalf of your brand, ask yourself: Is the whole enchilada worth the pint? Pingback: Što će startupima uopće brendiranje, pogotovo u ranoj fazi?